Laxogenin by Hi-Tech Pharmaceuticals – Natural Probolic Agent. Laxogenin 100 tablets are the leading 100 mg supplement in the nutritional supplement industry! Hi-Tech Pharmaceuticals tablets with Cyclosome technology ensure perfect absorption and bioavailability which currently have no rivals. With this formula of the supplement, your body will easily absorb the main ingredients, providing you with even better results than usual! What can you expect from Laxogenin? What is Laxogenin and how does it work? 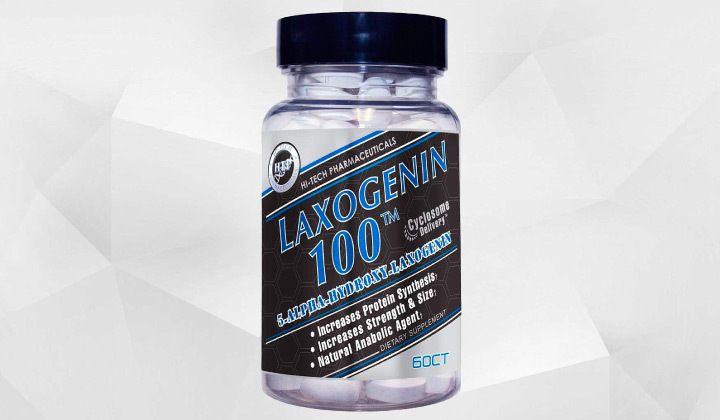 The Hi-Tech Pharmaceuticals Company presents Laxogenin 100 as a natural anabolic agent increasing protein synthesis and allowing faster recovery! Taking this supplement, you get all the benefits mentioned above without fears to experience harsh side effects! Being a natural plant steroid, the supplement suits men and women because it doesn’t anyhow affect hormone production in the body. You will see right away how well the supplement increases your strength and power. Moreover, it allows your body to recover faster after your cycle. You may do what you have to do to keep to your exercise routines without any delays. Being a plant steroid, Laxogenin is actually very much like prohormones and provides similar results but avoiding harsh side effects and without affecting your liver function. Lots of people find Laxogenin similar to the popular Anavar supplement, but again, with Laxogenin, you won’t experience harsh side effects. As the supplement doesn’t affect the body’s hormone balance, both men and women can safely take it. Laxogenin is a 100% natural supplement. It’s not synthetic or manmade. The supplement enhances protein synthesis, and it will allow you to build your muscles easier and keep up your gains. In addition, Laxogenin helps your body produce anabolics. They then increase your strength and allow you to build lean muscles which will recover faster after your cycle routines. Laxogenin controls cortisol levels too, and that is very important for bodybuilders. While exercising, you actually put your body through a lot of stress, and having a supplement to control cortisol levels will assist you with faster body recovery. While experiencing stress, your body enters the safety mode in which it stores more fat. However, you may leave all your worries behind when you have a supplement to control cortisol levels. The Hi-Tech Pharmaceuticals Company recommends you to take two tablets daily. Take them together with food. It’s best to take one tablet every morning along with food and again one tablet in 8 to 12 hours with food. You don’t have to take PCT with this product.